The winners of this year’s Chairman’s Volunteer Achievement Awards were revealed at a celebratory reception at Wymondley Priory Barns last Friday (8 February) . The awards celebrate people in North Hertfordshire who volunteer and ‘go the extra mile’ to make a real difference in their local community. Organised by North Hertfordshire District Council (NHDC), the awards were sponsored by Willmott Dixon, with The Comet as media partner. 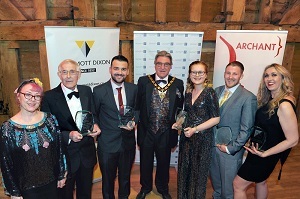 The winners were nominated by members of the public and chosen by the judging panel, which comprised of Cllr John Bishop, NHDC’s Chairman, Nick Gill, Editor at The Comet, Steven Roberts and Jack Wells from business sponsors Wilmott Dixon and Anne Taylor from North Herts CVS. Each winner was presented with an engraved glass trophy, bouquet of flowers and gift vouchers to acknowledge their volunteering achievements. Cllr John Bishop, NHDC’s Chairman said: "We are delighted that the hard work and dedication of volunteers in the district has been recognised by these awards. We owe our gratitude to these people who selflessly give their time and skills for free to help their communities." Shane Cole set up the Hitchin based 'Feed Up Warm Up' project last year. It operates every Wednesday evening, from the Scout Hut at Our Lady’s Catholic Church in Hitchin, providing hot food, food parcels, warm clothes, haircuts, chiropody, sanitary items and sign-posting services for vulnerable people. Shane said: "I feel honoured to have won this award. The work our team does is outstanding. From the Citizens Advice North Herts to the tea makers we all work together to accomplish our vision." Helen has supported the MS community in North Herts by volunteering and managing charity collections, dedicating her time and commitment to the organising of fundraising and social and well-being events, while continually being available to support those with MS.
Helen said: "I have been involved with the North Herts MS Society as a Welfare/Support volunteer virtually 43 years now. This has meant trying to help people diagnosed with MS to continue with their lives in a positive way." Suzy Holding is the brains behind the successful ‘Best Before Café’ which opened its doors in Letchworth last year. Suzy and her army of helpers work on a volunteer basis to tackle food waste by collecting supermarket food surplus and offering it to local people for donations of money, time or skills. Suzy said: "Winning the Green award for Best Before Cafe demonstrates how much the Letchworth community cares about the environment, food, a fairer society and each other." Callum has dedicated himself to football by coaching people with disabilities and taking the Hitchin Town Ladies from relegation to top of the league in two years. His dedication to the ladies team has brought not only great achievement but outstanding sportsmanship. Callum said: "I am proud to have been recognised of my achievements within the three years I’ve worked with Hitchin Town Ladies FC. All those at Hitchin Town Ladies FC I cannot thank enough for the support because without them the club wouldn’t be here". Chris received the award for his involvement with the Walsworth Community Centre for over thirty years. He has been instrumental in the transition of the Centre to its new lease and has been at the forefront of the building’s refurbishment. Chris said: "I am honoured to receive the Chairman’s Award for my involvement with the Walsworth Community Centre working with the volunteers and charity groups at the centre. It has been my pleasure to serve the community." Lucy is very actively involved in her community. A Beaver Leader, member of the Church Choir, and a St John’s Cadet; she also represented Letchworth at the Lord Mayors Show and the London Pride march. Lucy said "I am extremely honoured and proud to be receiving this award." Left to right: Claire Morgan, NHDC, Chris Parker, Shane Cole. Cllr John Bishop, Lucy Cook Allen, Callum Ellis, Yasmin-Kate Patterson (received the Green Award on behalf of Suzi Holding).